First, I want to thank everyone for entering and leaving me the most wonderful comments. Because I got so much more feedback than I was expecting, I'm giving away some bonus prizes. One of you will get the book, and two lucky other commenters (commentees?) will get a surprise package from me of something delicious and maybe a picture. And without further ado.. the winners!! 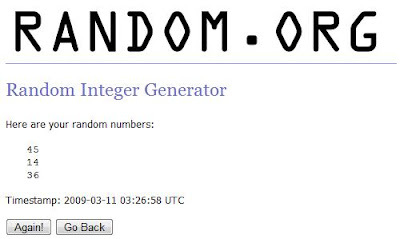 The winner of the book is commenter #45, Ellen from I am gluten free! and the two other surprise winners are commenters #14, Melodie from Full Circle and #36, Tracey!! Melodie I need your email address to get in contact with you! Ladies, please let me know if you have any other food problems besides gluten (nuts? eggs? dairy?) so I don't send you something that might accidentally kill you. I don't want that. Congratulations! I will be having more giveaways in the future for sure, since this one was so successful. Bummed you didn't win? You can still buy the book (in its new paperback form!) on Amazon for $10, which is pretty cool. Im one of the surprise winners. woohoo.. Thank you sooo much. Yay...I never win...I'm SO EXCITED! and I thought that I was excited when I saw that chocolate cake. Okay, Here's the email address. Love your cake to frosting ratio!